With the most effective way exercises arms and legs for whole body conditioning ,soft foam handles is comfortable. 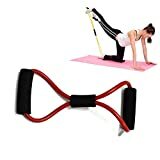 Both for men and women, great for home-based strength training. High TPR material will not over-stretch. Allows you to tone and sculpt every muscle group.Excellent for stretching muscles. ·It will not recoil and twinge your chest hair as it may sometimes happen with the metal springs.